Tables used for cocktail hour are usually 30 inch or 36 inch round tables. Sometimes these tables are low and used with 4 chairs around them and sometimes they are at standing height (42 inches). They may also be referred to as highboys or lowboys. 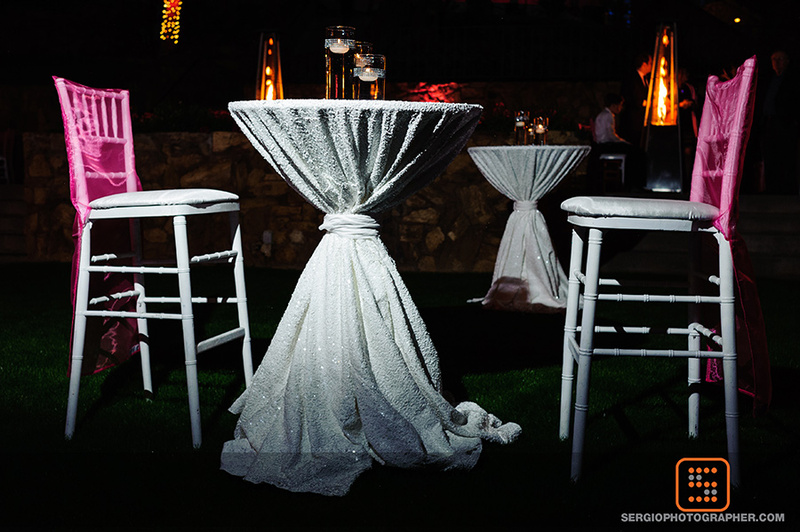 Low cocktail tables are frequently used as sweetheart tables for the happy couple at a wedding reception. When seating your guests for a meal there are quite a few table choices. First you should decide whether you want round, rectangular, or a combination of both. Round tables range from 48 inches (seating 6 guests) up to 72 inches which will comfortably seat 10. Rectangular, or banquet, tables come in 4 feet (seating 4 guests), 6 feet (seating 6 guests), and 8 feet (seating 8 guests). You may also find rental companies or venues that offer square or serpentine (curved) tables. When thinking about linens you should consider where you want the linen to fall on the table. There are a variety of options including lap or mid length, floor length or even long enough to create a small puddle of fabric on the floor at the base of the table. For high cocktail tables, you can have a linen that hangs to the floor or have a longer linen that is gathered in the middle with a tie. There are some awesome charts and pictures out there to show you exactly what you can do to help make sure all your guests are seated comfortably at a beautifully covered table. You can do a simple internet search for rental table sizes or linen sizes and get a bunch of references. Two charts that I go back to time and time again are from Pacific Party Canopies and Cover Ups. And of course, if you need help just ask!! Your wedding planner, rental supply consultant, and venue coordinator will be happy to answer any and all questions you have to make sure you get the set up that is right for your event!